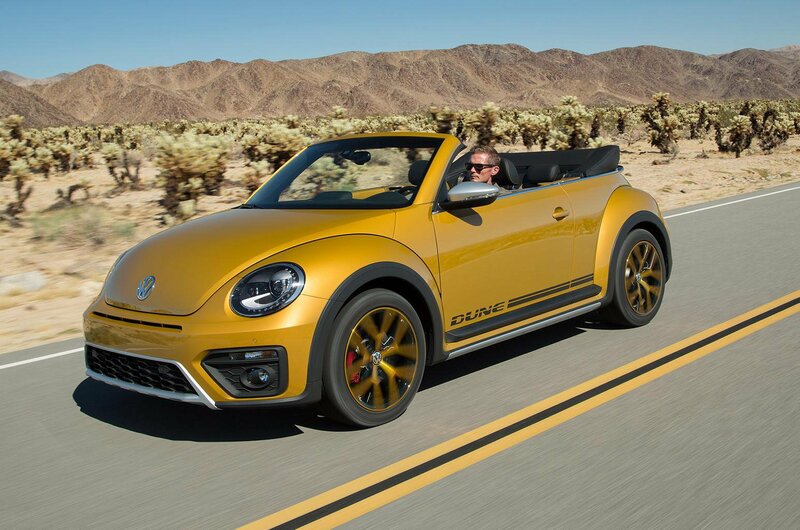 2016 Volkswagen Beetle Dune 1.8 TSI Cabriolet prototype review | What Car? The Volkswagen Beetle Dune was first revealed at the Los Angeles motor show in November last year, and will go on sale in the UK later this spring. This is the first Beetle with SUV styling and, therefore, something of an experiment for Volkswagen. The Dune features a raised ride height, wider wheel arches, bulkier side sills and a bespoke front bumper, all designed to give it a more muscular appearance. In the UK, the Beetle will be offered with three petrol engines and two diesels, with power outputs ranging from 103bhp to 217bhp. It'll also be offered in three-door coupé and cabriolet forms. This is an early pre-production model, however, and features a 168bhp 1.8-litre turbocharged petrol engine, which won't be coming to the UK. The engine sends its power to the front wheels - there will be no four-wheel drive option in the Beetle Dune - through a six-speed DSG transmission. A six-speed manual will also be offered in the UK. What's the Volkswagen Beetle Dune like inside? The cabin of the Beetle Dune looks and feels premium, but has also been upgraded from the standard car to include bespoke elements. There are new graphics for the instrument cluster, contrasting stitching on the steering wheel and seats, Dune badging and a chunky plastic centre console inside. The colourful cabin does a good job of matching the Dune's bold exterior styling, and makes the car feel more special than other Beetles. The driving position is good, too, and thanks to its raised ride height the Dune offers good all-round visibility. The front seats are comfortable and supportive over long distances, although, as with the regular Beetle, the rear seats are best left for luggage and small children. There's a reasonable amount of boot space on offer at the rear, at least, but it's no more than what you'll find on the regular Beetle Cabriolet. What's the Volkswagen Beetle Dune like to drive? The 1.8-litre petrol engine tested here isn't coming to the UK, which is perhaps just as well because it felt slightly underpowered. Despite having 168bhp, the petrol engine quickly ran out of puff when asked to pull the heavier Dune. On tarmac, the Beetle Dune offers a comfortable ride with light and accurate steering, which weights up well at speed. On the motorway there's some wind noise, but it's never intrusive. The soft-top folding roof is easy to operate via a button in the cabin, and the Dune arguably looks at its best with its roof stowed away behind the rear seats. Venture off-road onto gravel tracks and other light off-road terrain, and the Dune handles itself well - this is likely the limit of what most owners will ask the Beetle to tackle. The Beetle Dune is a classic case of style over substance. It doesn't have much to offer by way of off-road performance, and while its on-road manners are perfectly acceptable, it's never going to be tackling any actual dunes. That said, Beetle enthusiasts aren't likely to be phased by this, instead seeing the Dune as a fashion statement. On that front alone, the Dune probably succeeds. With UK prices set to start at around £20,500 for the coupé, and around £23,500 for the cabriolet seen here, the Beetle Dune will be well placed in the Beetle range. However, it will be more expensive than rivals such as the Mini Countryman and Fiat 500X.